A few years ago Rich Buceta was a New York digital advertising executive with a homebrewing habit and a stellar collection of Les Paul guitars. In 2011 that all changed when Rich decided to make brewing a full-time endeavor. 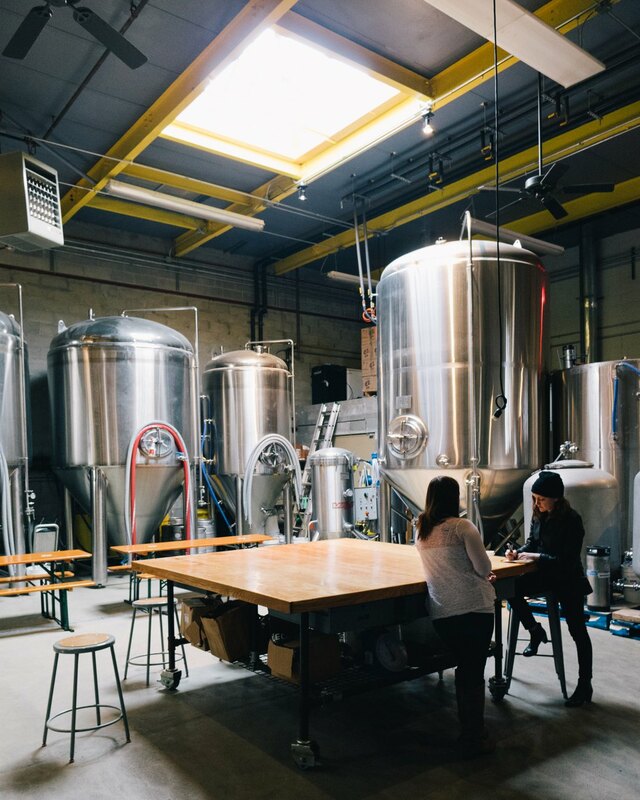 Rich spent a year interning with Greenpoint Beer Works (the Clinton Hill Brewery where Kelso and Heartland brew their beers) to learn the ins and outs of the craft brew industry. Meanwhile he sold off his prized collection of guitars to generate the capital to open his own beer establishment. In 2012 he opened SingleCut Beersmiths, named for the guitars that had been sacrificed for the making of great beer. This past weekend we ventured up to Astoria to check out SingleCut Beersmiths ourselves and were quite pleased with what we found--all the trappings of a modern beer hall. 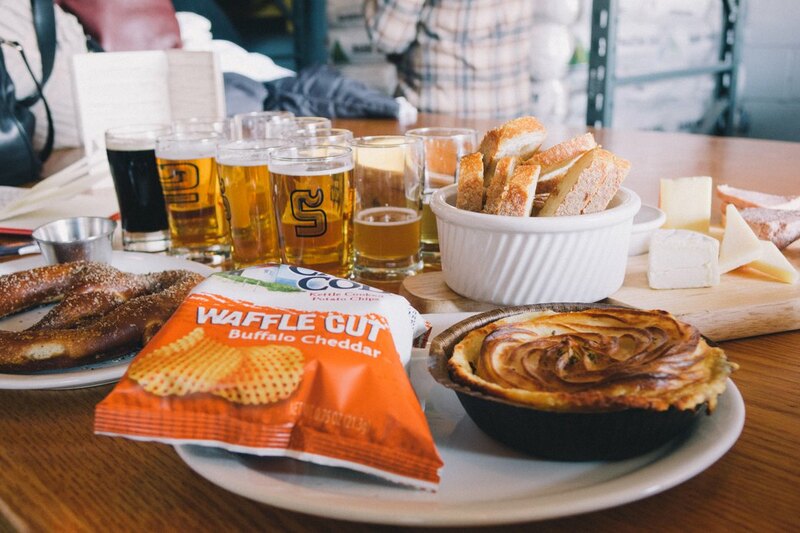 SingleCut, which hosted a small, 4-tap tasting room when they first opened, now serves 13 taps, a full food menu, and has five times its original seating capacity. The space is large and open with high ceilings, low lighting, and a suiting industrial vibe. 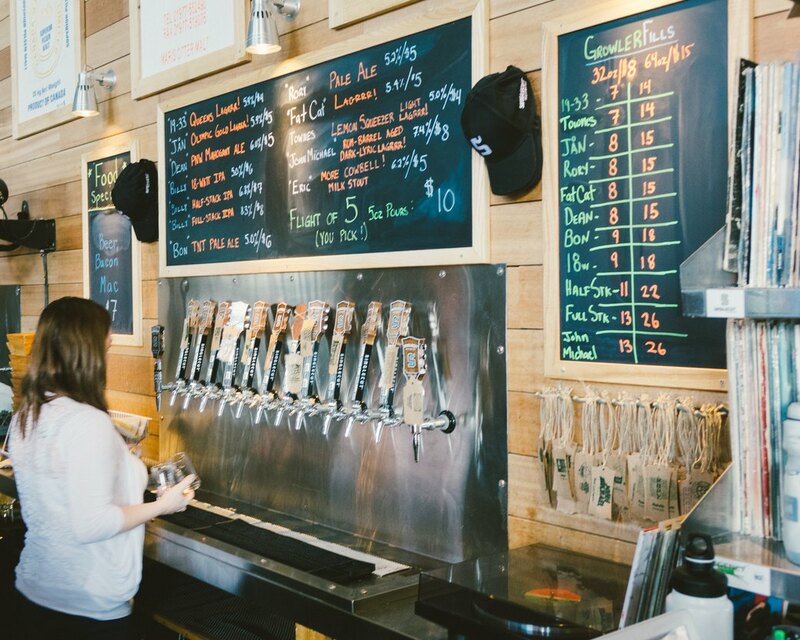 With a large garage door in the front, rum barrels for aging beer lining the walls of the tasting room, and large steel tanks just visible in the room beyond, you never forget the fresh brews on which your sipping were concocted in the other room. Start your flight with the “Jan” Olympic Gold Lager coming in at a 5.4% ABV (that’s alcohol by volume, folks). SingleCut focuses on developing unique largers, a style often overlooked by beer geeks, and their innovation is well played in this wheat lager brewed with orange zest, pink peppercorns, and coriander. The result is an aroma of fresh cut grass and lemons, and an herbal citrus taste that makes you feel like it’s spring, in your mouth at least. Move on to the “Bon” TNT Pale Ale with a 5.2% ABV and dry hopped with Aussie and New Zealand hops that give it an aroma of overly ripe mangoes that carry over to a tropical flavor with a pleasantly bitter aftertaste. Next get your malt on with the “Dean” PNW Mahogany Ale (an ABV of 6%). The aroma is of toasted toffee and caramel from the malts, balanced nicely on the tongue with dry and piney hops. For your fourth beer move on to the big guns, but you have options. 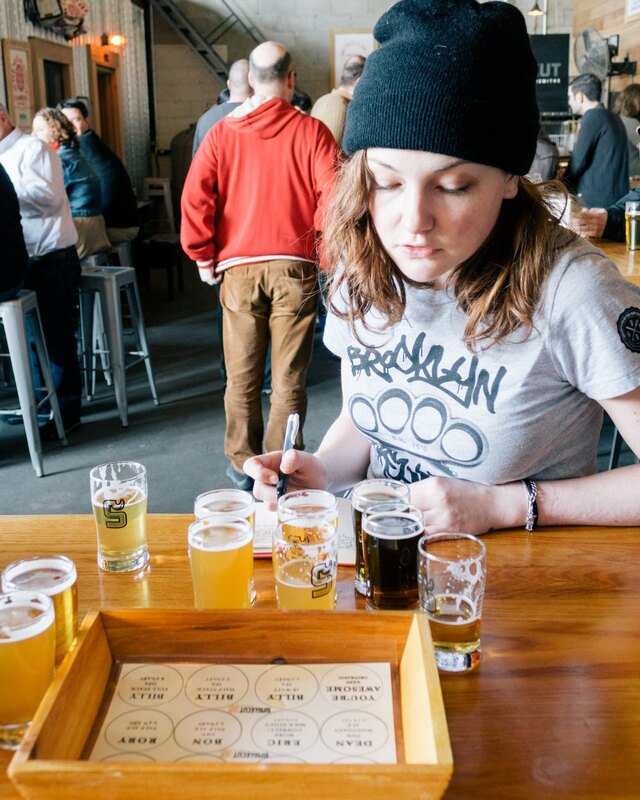 Decide how big you want to go by selecting your iteration of their “Billy” IPA. All are deliciously hopped, with heady fruit aromas and the strong flavor of dank pine and fierce citrus notes. The “Billy” Half-Stack is pitched as such: “Crank the hops to the point right before taste buds bleed… if it’s too hoppy, you’re too old.” At 6.8% ABV it’s a big beer and hoppy all right, but I of course recommend going all the way with the “Billy” Full-Stack, an imperial IPA that pushes the hops even further and has an 8.6% ABV. Round out your tasting with a real kick with the “John Michael” Rum Barrel Aged Dark Lyric Lagrrr! (7.4%)–another prime example of a boundary-pushing lager. This guy has been aged for over a year in rum barrels, quite the move as whiskey barrels are currently en vogue for folks looking to age their brews, then rounded out with the addition of a little milk stout, which I wrote about a few weeks ago. The result is a decadent brew with a strong aroma of rum tempered by coffee notes from the stout. Likewise tastes heavily of rum and vanilla rounded out with a rich, bready maltiness. Rumor has it this one will be on tap soon at Dear Bushwick as well. Note that each beer is named for some of rocks finest guitarists, but SingleCut’s love of music is carried on beyond the naming of the establishment and it’s beer. 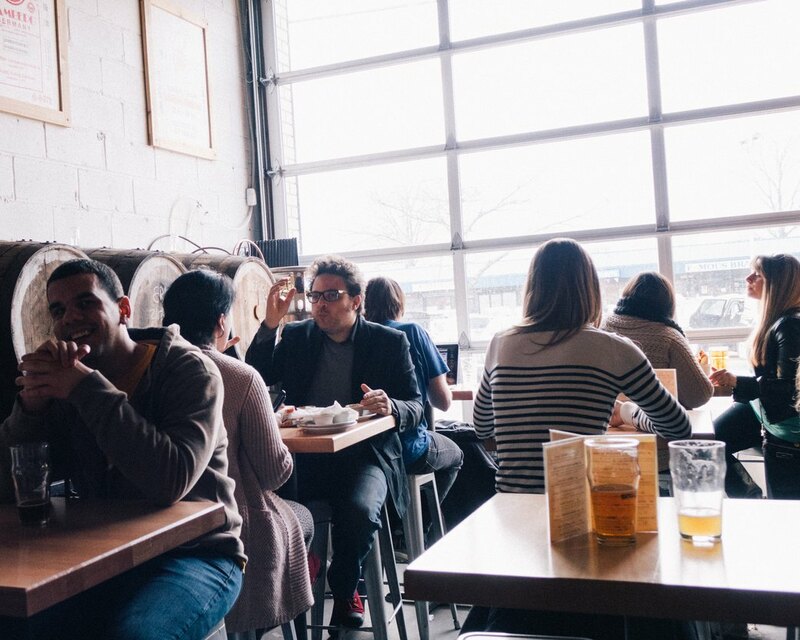 Most of the staff are musicians and in the spring and summer rock, folk, and bluegrass bands play every Friday night in a lofted space above the tasting room. Much of this music features features SingleCut employees including Bandsaw, Rich’s band who will play on April 11th. The music sessions start April 4th with the band Green Gallows in which two of its bartenders play. 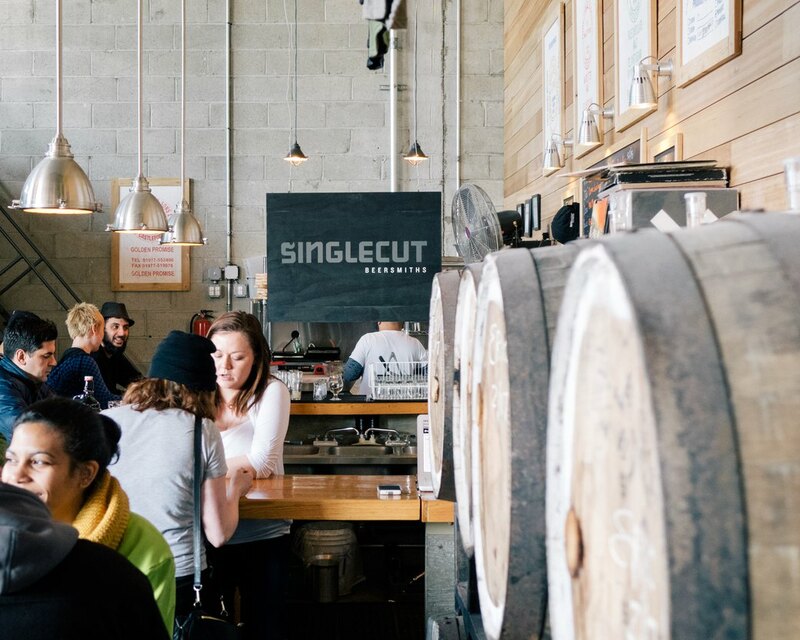 You can find SingleCut beers on tap throughout Bushwick at Tandem, Dear Bushwick, Hops and Hocks, and The Sampler to name a few. It’s sure to be nice and fresh because SingleCut currently opts out of going through a beer distributor, which allows them to prevent their kegs from sitting on the shelf before delivering. But we recommend taking advantage of the next sunny day and making the trek to Queens to taste them on-site in their element with rock tunes playing in the background and good beer people drinking all around. 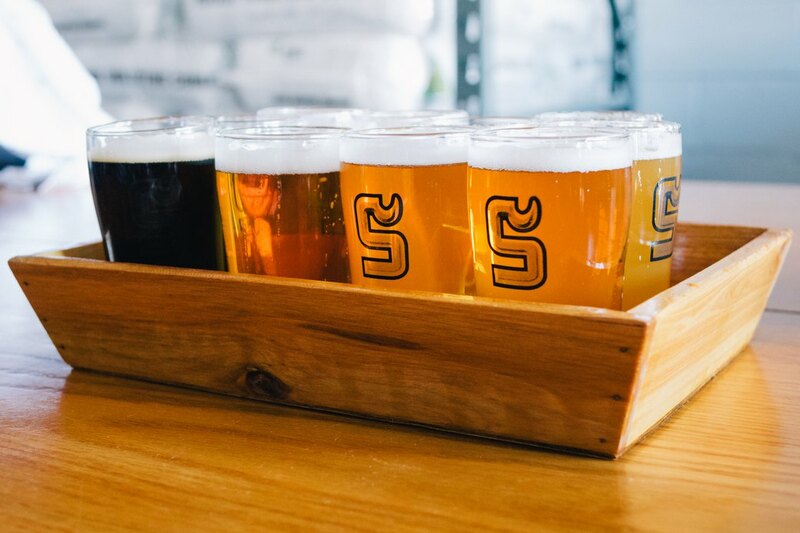 SingleCut Beersmiths gets 4/5 stars – 2 for their tasty and creative brews, 1 for serving good food to soak up the alcohol, 1 for their backstory and incorporation of music into their identity, and 1 for being causal, clever, and entirely focused on the beer, everything a brewery should be. SingleCut Beersmiths is located in Astoria, Queens at 19-33 37th St, just North of 20th Ave, a short walk from the final stop on the N or the Q. They are open Thurs 4pm-11pm, Fri 4pm-1am, Sat 1pm-1am, and Sun 1pm-8pm. They have tours every Sat at 3 and 7pm and Sun at 4pm. They also fill growlers to go!